ONE of the cornerstones of a democracy is a healthy civil military relationship. India stands out as the greatest success story in civil military relations amongst developing nations of the world. The nation and its military are rightfully proud of it. 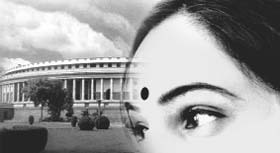 THE adoption of the Constitution (108th Amendment) Bill by the Rajya Sabha which provides for the reservation of one-third seats in the Lok Sabha and Vidhan Sabhas on March 9, 2010, has created widespread euphoria among the liberal sections of Indian society in general and the women elite in particular. CHANGES in the Bharatiya Janata Party and approval to its new chief Nitin Gadkari’s list of functionaries by the Sangh Parivar reflect its desperation. 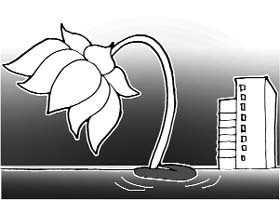 The party’s failure in two elections to the Lok Sabha showed the limits of reach of the basic ideology on which it was being driven for the last two decades. Lyricist and script writer Javed Akhtar’s nomination to the Rajya Sabha got delayed by three months. He was told in January that he was being nominated to the Upper House and his friends began calling and congratulated him. However, when the first list came out, his name was missing. International reference books giant Encyclopedia Britannica would hit Indian classrooms next month with its plans to enter the curriculum market by publishing textbooks in four subjects — computer science, mathematics, environmental studies and general knowledge. However, should the discourse on civil military relations remain confined to the facts that in our country there have never been open criticism of the government’s policies on military affairs, never any combat refusal, or anything like a threat of military takeover? Unfortunately, most of our experts and the media are content to focus on the presence or absence of civilian control, politicisation, military discontent and discipline as the only considerations worthy of attention. Little attention is paid to the dynamics of politico-military strategies and civil military discourse on military capabilities and doctrines for any future conflicts. In his seminal book, The Soldier and the State, Samuel Huntington states that “the objective of military security policy of a nation is to develop a system of civil military relations which will maximise military security at the least sacrifice of other social values.” Is India getting maximum value from its civil military relations and discourse? Indeed, India’s defense and security report card for the past six decades plus has been more positive than negative. Despite a weak strategic culture, reactive strategic policies, ad hoc defense planning, intelligence failures and strategic surprises, the armed forces have maintained India’s security and territorial integrity better than any other democratic, developing nation in the world. However, the credit for these successes goes less to any strategic foresight or higher direction of war and more to personnel involved in operational planning and fighting on the ground. In most conflicts, India has failed to convert hard-won operational achievements into long-term strategic successes. The 21st century has ushered in a new era in security and the nature of conflict and warfare. While conventional war as an instrument of foreign policy has become increasingly unviable due to high costs, casualties and international pressures, limited, asymmetric and sub-conventional conflicts have become more likely. And when they occur, it is not possible to take them to the logical conclusion of military victories as was the case in the past. They have to be conducted with the objective of achieving political successes rather than military victories. The USA and its allies could not achieve victory in Iraq, Kosovo or Afghanistan. In Kargil war, too, the political aim and terms of reference prevented the Indian military from crossing the Line of Control and escalating the conflict. With such a paradigm shift in the nature of conflicts, the military has to be prepared for an elongated spectrum, ranging from aid to civil authority, counter-terrorism, different levels of conventional war, to a war involving weapons of mass destruction. In this environment, the separation between tactical, operational and strategic levels of warfare stands blurred. Greater mobility, long reach in targeting and more effective communications and control have obscured tactical and strategic boundaries. A small military action along the Line of Control or a terrorists’ act in the hinterland become issues for consideration and decision making at the highest political level. In such a war or war-like situation, selection of political and military objectives and time available to execute missions becomes crucial for planning and conduct of operations. There has to be complete understanding between the political and military leadership on these issues. lPolitical definition of the goals and its translation into military objectives. This is always difficult, sometimes uncertain and indirect. Yet its success is critical for the attainment of the political goals. lAbility to react rapidly to a developing or a surprise crisis. The military would be expected to react quickly: enhance deterrence, arrest deterioration of the situation, diminish adversary’s incentives for escalation, and/or to carry out a riposte. lMobilising and sustaining domestic and internationally political support for such military operations would depend upon the ability of the military to operate in a manner that conforms to political legitimacy, i.e. avoid civilian casualties and minimise collateral damage. lMilitarily, the greatest challenge would be the political reluctance to commit a pro-active engagement and its insistence to retain the authority for approving not just key military moves but also many operational decisions. lPolitical requirements and military targeting would need a heavy reliance on intelligence, surveillance, and reconnaissance for target selection. Airpower, precision guided weapons, standoff armaments, and artillery would be first weapons of choice. lEmployment of ground forces across the borders may be discouraged or delayed. lOwing to growing transparency of the battlefield, information strategy and its implementation would be important. Political requirements of the military operations to achieve and retain the moral high ground and deny that to the adversary would need a comprehensive and sophisticated media, public affairs and information campaign. This then leads this writer to ask, is India getting the required advice from our military? Do we have the right national security system and processes for this purpose? Every nation requires strategically sound — not just militarily effective — advice to political authorities who are representative of and answerable to Parliament and a vibrant civil society. lDoes our military demonstrate critical and creative understanding of the strategic purposes, contributions and consequences of military operational employment and institutional conduct? Does it demonstrate a willingness to speak up, and when necessary speak out, especially in opposition to strategically flawed policies and initiatives? The military brass has a duty not only to the political masters but also to the Constitution and the men that they command. lDo our civilian authorities demonstrate critical understanding of larger strategic issues, constraints, effects and implications of military operational employment and its institutional conduct? Are they fully conversant with military purposes, capabilities, constraints and effects? lAre the civilian authorities who oversee the military adequately competent strategically? Do we have the correct political supremacy and oversight of the military or is it very substantially through a bureaucratic proxy? Encouraging a timid military may be good for the civilian ego. But equally, that makes for poor strategic sense. War, Clausewitz noted, is continuation of politics by other means. Recent wars have involved much greater level of integration of politics, diplomacy and military planning and execution than in the past. Even when a decision to employ the military is made, the political leadership seldom allows autonomous conduct of the war to the military. In practice, there is continuing erosion of the dividing lines between war and politics. India’s national security framework and its antiquated civil–military relationship have not grown in step with the needs of new security challenges. It is essential that we change our mindsets and attitudes and look beyond narrow boundaries defined by turf and parochialism. For that, we need urgent changes in our security structure and procedures to make it more efficient, resilient, and speedily responsive. Nevertheless, it would be prudent to learn lessons from the enactment of the Constitution (73rd Amendment) Act, 1992 and its working since its implementation through conformity-legislation by various states in 1994. Rajiv Gandhi, the then Prime Minister, could not get the Amendment Bill passed by the Rajya Sabha in 1989 despite the massive mandate that he had obtained in the 1984 parliamentary elections. 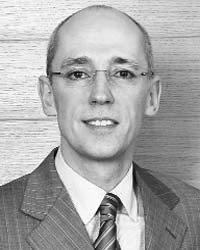 Whereas Prime Minister P.V. Narasimha Rao was able to get it enacted though he was heading a minority government in 1992. Narasimha Rao succeeded because of his skill in consensus building. Luckily, the present Prime Minister, Dr Manmohan Singh, has been successful in getting the support of the BJP and the Left Front for sailing the Bill through the Rajya Sabha by an overwhelming majority. However, a more difficult task for him will be how to evolve a consensus in its favour in the Lok Sabha due to the determined opposition of some regional parties and the prevalence of the unfounded misgivings over the Bill among a section of the minorities, the Backward Classes and the Scheduled Castes and Scheduled Tribes. Therefore, instead of acting in a tearing hurry, Dr Manmohan Singh should allay their baseless apprehensions by using his consummate skill before moving it in the Lok Sabha. Its subsequent ratification by half of the states would, however, be no problem if he is able to carry with him the Lok Sabha in its favour. It has to be borne in mind that the provision for rotation of the reserved seats for the women in every election alone will not do unless the possibility of promotion of proxy representation of sitting MPs by their wives and daughters, as has happened in the panchayati raj institutions to a considerable extent, is completely removed. Besides, it could also inhibit the growth of women leadership and thus lead to wastage of the experience gained by them in their first tenure. Moreover, some women MPs may not care to nurse their constituencies because of a persistent feeling that they will not be contesting from the constituency for a second time. It needs to be emphasised that the creation of single-member constituencies for women is bound to deprive the men of their right to contest election. It may also restrict their choice as voters because they have to vote for the women candidates even if they do not deserve and hence some of them may even refrain from exercising their franchise. This is not an uncommon phenomenon in the elections to the panchayati raj institutions. More important, it may be safely generalized that on the basis of various field studies, that the Constitution (73rd Amendment) Act, 1992, has only given adequate representation to the women who earlier had only a token representation through a system of cooption. But it has not led to their real empowerment in most cases. Only those women representatives have been genuinely empowered who were well educated, considerably articulate and physiologically strong. They not only get unstinted support from their families but also have linkages with powerful political leaders. Of course, the women with past experience in social work and politics, too, have been empowered. However, a sizable proportion of women representatives in institutions of grassroots democracy have been able to get status but not power. This could be repeated in the Lok Sabha and the Vidhan Sabhas as well after the Constitution (108th Amendment) Bill becomes an Act. Therefore, a cautious and tactful approach will have to be adopted for ensuring that this Bill becomes an Act and serves the intended purpose. For this, the regional satraps will have to be convinced that no one prevents them from nominating women belonging to the minorities, the Backward Classes and the Scheduled Castes, Scheduled Tribes from the seats reserved for women. They will also have to be reminded of the fact that the Constitution does not permit religion and caste-based reservation in the Lok Sabha and Vidhan Sabhas except for the Scheduled Castes and the Scheduled Tribes. The Supreme Court and the High Courts are bound to declare such a provision ultra vires the Constitution. There is a need for creating double-member constituencies in both the general and the Scheduled Castes/ Tribes constituencies. From each double-member constituency, the male and the female contestants getting the highest number of votes could be declared elected. And these constituencies should remain as such for at least two terms for proper political training of the women MPs and MLAs. Moreover, social and economic empowerment of women will have to be ensured through a proper system of education. Their psychological empowerment will have to be done through the needed socialisation process. Systematic, strenuous and concerted efforts in a mission mode should be made for the capacity building of the women leaders through their pre-election and post-election training by the NGOs, the women study centres of universities, the women cells of the colleges and the training institutes at the national and state levels. One-third reservation of seats in the Lok Sabha and State Assemblies through a constitutional amendment is the only way for ensuring the ultimate empowerment of women. This task cannot be left to the political parties as all of them have been found lacking and unreliable over the years. For nearly 30 years, the BJP had been striving to make inroads into the Indian minds based on its ethno-religion ideology as demanded by the Sangh Parivar. It never realised that these issues would have succeeded in the era when Indians were struggling against the colonial rule. But it could not have appeal when Indian minds were striving to emerge as the economic power. The Congress had successfully pursued the economic development as its theme for nation building. Secularism was an essential ingredient for the rapid economic development. Its appeal became even more ineffective after the Narsimha Rao government adopted the economic reform programme. It radically transformed the aspirations and ambitions of the young generation that was exposed to education base and with powerful means of communications. The Sangh philosophy’s limitations in wooing voters were exposed in the 1957 and 1962 elections. It could improve its vote share merely by half a per cent in five years. It tried in early seventies to gain legitimacy through alliance with other parties. It pushed to the backburner controversial issues to gain support of other parties after it failed to retain its government beyond 13 days in May 1996. The Vajpayee government pursued for six years the economic reform programme with more vigour to improve the growth rate. The Cabinet had few heads that were not seeped into the Sangh philosophy. The BJP leaders were also apologetic about their inability to move even a step further in furthering the Hindutva agenda. But these attempts to retain a new image were thwarted by the other front organisations of the Sangh Parivar who insisted on implementation of the Sangh agenda. The sustained campaigns by the Vishwa Hindu Parishad and Bajrang Dal kept the doubts lingering that the BJP stance of brushing aside the controversial issues was merely a sham to build the party so that it could win election with its own majority. The party did not realise that despite the support it sought from classes other than the urban and educated upper castes, it had not opened its doors for other classes in the leadership structure. The BJP leaders campaigned for the 2004 election on the slogan of ‘Shining India’ without a closer study of its achievement in the economic development. This slogan did not ring the right bell for the masses. The RSS workers who campaigned for the party could not bring votes to the BJP box. The RSS had in fact reduced the status of the leader who was later projected as the BJP candidate for the Prime Minister’s post when he was eased out of the party president’s office in 2007 for his remarks on Jinnah during a visit to Pakistan in July 2007. More confusion was added by kite-flying of Mr Narendra Modi’s name as another potential candidate. Rajnath Singh confirmed the party ideals when he propped up Varun Gandhi for having spewed venom against the Muslims and the Sikhs during his poll campaign in 2009. Selection of man known for his priority to development issues instead of from among four potentials whose names were making rounds as well as endorsement to the list of the national executive may spell a desire for change. It may indicate that the Sangh has accepted the limited capacity of its trained pracharaks in wooing voters. There is, however, other ominous signs that cannot be overlooked. The Sangh chief had bypassed four known aspirants for the post who were slogging at junior levels for more than a decade. A new man was chosen from Nagpur to head the party. His first major action came as a great disappointment for he stuffed the team of his functionaries with more Brahmins and upper castes. Even among 33 per cent women on the new team, none was from OBCs or Dalits. There is overrepresentation to Brahmins, mostly from Maharashtra. He was anxious to depend on notables from outside rather than from within the Sangh stable to indicate a change. The RSS may want to cause an impression that it would like the BJP to shift its emphasis to new issues that would attract the youth. Before the 1971 election too, the Sangh indicated a change in its thinking when it allowed association with former princes and ex-landlords as the Sangh candidates. But it was without opening doors for them to be a part of its leadership structure. Nor did it realise the contradiction inherent in this because only a year before the party had demanded land reforms to improve agricultural productivity and help small and marginal farmers. The party could not even see the glaring contradiction in its approach and was beaten. But it has not learnt a lesson. The Sangh wants a change but is not willing to experiment with what is necessary. It continues with its aversion with other classes of Indian society by refusing to open the leadership structure to accommodate representation for others in the Hindu society. The cosmetic touch that is mirrored by bringing in new faces would not take the party far off on the road to the Raisina Hills. Now that Javed is a member of the Rajya Sabha, heavy responsibility devolves on him. He will be the second member of his family to have been nominated to the House of Elders. His actress wife, Shabana Azmi, remained an MP for two terms. She was an active member taking up, besides the problems of the film industry, social issues like empowerment of women. Javed too has promised to take up social issues more vigorously than his wife. His priority is the Women’s Reservation Bill, already passed by the Rajya Sabha. He has joined issue with Shia cleric, Maulana Syed Kable, who stated publicly that women should become mothers of good leaders rather than trying to be leaders themselves. The lyricist’s reply to Maulana Kable was that the “Taliban mentality” was unacceptable to the Muslims and 99 per cent of the community supported the empowerment of women. 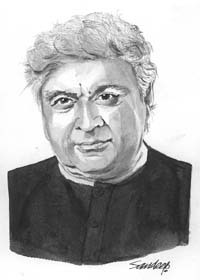 Now 65, Javed Akhtar, is a well known in India and Pakistan as an Urdu poet, lyricist and script writer for Bollywood films. His songs are rhythmic, reflective of life and young and old are often heard humming them. Few have such rich literary family background as Javed, as if poetry flows in his veins. Son of the well-known Urdu poet and lyricist Jaan Nisar Akhar and Safia, also a writer, Javed belongs to a lineage that could be traced back to seven generations of writers. The highly respected Urdu poet, the late Majaz, was his “Mamu” (mother’s brother) and the work of his grandfather, Muzter Khairabadi is seen as a milestone in Urdu poetry. Two lines of Muzter — Tumko dekhaa to ye kayaal aaya, zindagii dhuup, tum ghanaa saaya— (after seeing you, a thought comes to my mind; life is hot sun and you a thick shade over it) — have become immortal in Urdu poetry. Javed’s parents were lecturers in Bhopal’s Hamidia College. He went to school in Bhopal, Calvin Talukadar College in Lucknow and Minto Circle in Aligarh. For his graduation, Javed returned to Bhopal and obtained the degree from Safia College. He started writing poetry in Urdu, came to Bombay and knocked at the doors of film producers. During the initial days of his film career, he was a clapper boy. It was the film Sarhadi Lootera (Robber at Borders) that gave him the break. Director S M Sagar was desperately looking for a script writer but could not find a suitable one. His eyes fell on Javed who, he thought, had the talent he was looking for. The young man from Bhopal was assigned the task of writing dialogues. Subsequently, Javad made rapid strides in the filmdom in partnership with Salim Khan with whom he wrote some of the biggest hits in Indian cinemas during the seventies and eighties. 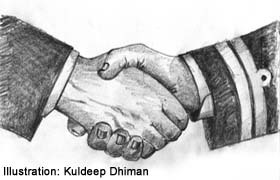 The partnership split following some differences. Javed became independent and in the years to come became the highest paid lyricist in India. It is believed that he can do magic with words, can breathe life into inanimate words, can weave three-minute dream through verse; can evoke 20 different emotions in a single song. Javed has written a number of poems against communalism, social injustice, national integration and for women’s rights. The Union Human Resource Development Ministry has declared his song, beaconing the misguided youth to come forward and build the country as the National Anthem for Youth. At the initiative of former President Dr A.P.J. Abdul Kalam, Javed wrote five poems on the national flag. These have been interpreted musically by Pandit Jasraj, Pandi Shiv Kumar Sharma, Ustad Zakir Hussain, L. Subramaniam and E. Srinivas. International reference books giant Encyclopedia Britannica would hit Indian classrooms next month with its plans to enter the curriculum market by publishing textbooks in four subjects — computer science, mathematics, environmental studies and general knowledge. The first series of books covering the NCERT syllabus of Class 1 to 8 were developed six months ago and would be made available to the students this year. To make school education exciting, it would launch its first set of curriculum books in the North Indian states. Company’s global head Jorge Cauz spoke to The Tribune in New Delhi about Britannica’s new venture. Q: Why did you select Indian curriculum market? A: The school curriculum publishing market in India is huge. There are multiple examining boards such as the CBSE, the ICSE and State Boards that implement their specific syllabi in various schools. Though the government schools use books published by the government bodies, private schools are free to choose books by private publishers. Q: What are your new initiatives for this academic school session? A: The Britannica books cover the National Council for Education, Research and Training (NCERT) syllabus for Classes 1 to 8. In the beginning we are looking at bringing out books for the NCERT on national level and state-specific books for the State Council Educational Research and Training (SCERT). Some special additions have to be made when we are mapping out books for different state boards as we want students to associate with their curriculum books on a practical level with their surroundings. The states we are targeting now are Delhi, Punjab, Jammu and Kashmir, Haryana and Uttar Pradesh. Q: What’s special about these books? A: Education has become a big factory where students are being churned out. The Indian government has also taken steps like doing away with the board exams. We have tried to put in an element of interest and adventure in our books. Chapters have icons and characters who take the students from one step to another. With the help of illustrations and interdisciplinary knowledge, we have tried to move away from the idea of typical syllabus books. There is also material in the books for exceptionally bright students who would like to take it up as a challenge to do the higher-end thinking. The books cost between Rs 100 and Rs 165 in India. Q: What was the main reason behind choosing the subjects? A: While we are planning to launch new series on mathematics, social studies and science later this year, we have made a humble beginning by putting together a team of experts to take out books in four subjects initially. Most students find mathematics hard to understand, so we took it up as a challenge to relate the numbers to surroundings of the students. Our books have special content for the laboratory-based studies, even for mathematics. The general knowledge books are made by the quizzing genius Siddhartha Basu. Q: What kind of response did you get from the schools? A: Basically, we are targeting chains of schools in North India. Besides curriculum books, we have published nine teachers’ manuals that are an introduction to the books guiding the teachers through content, grading system, allocation of time, teaching tips etc. In Punjab, out of total nine chains of schools, six have already adopted our books. Q: What is the Internet curriculum initiative that you are launching? A: It would be subscription-based interactive portal that would be launched by this year-end. A: For next two years, we have plans to take out English grammar series and a main English series along with mathematics, science and social science series for the Indian Certificate of Secondary Education (ICSE) board schools.